Its NYE!! Time to pop the champagne! (or in my case, sparkling cider) I can’t believe its almost 2015! This year has flown by, and looking back there were some awesome memories made this year, and also some very hard and dark times for our family. I’m so excited to start a new year with new goals, and a clean slate. My New Year resolution is to work harder on compassionate service. I always get these inklings to bring cookies to a neighbor, or call a certain friend out of the blue. I live such a busy life, I sometimes ignore it. Not anymore. I also want to start eating healthier and exercise more often, but seriously who doesn’t say that? haha 2015 is going to be an amazing year! 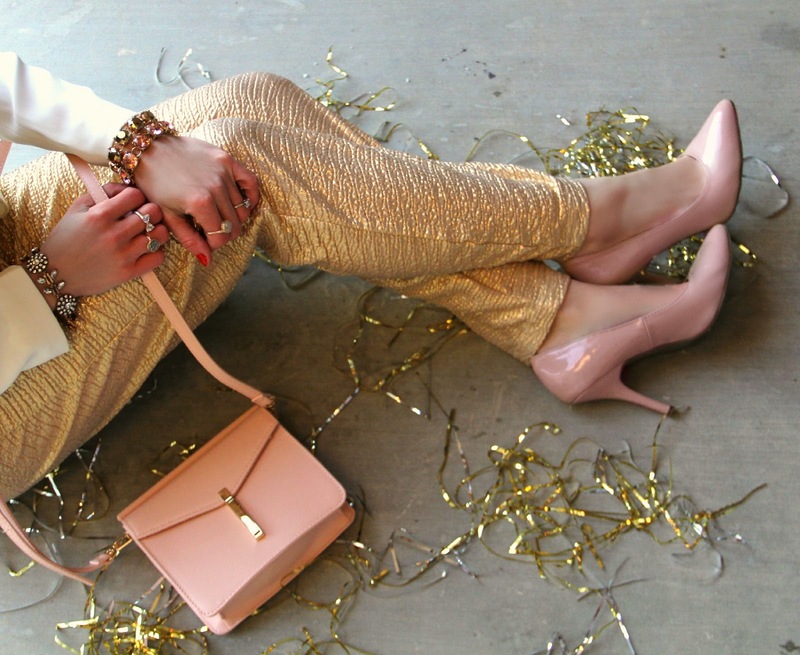 Todays post is inspired by all things glam, and how to dress up to ring in the new year! I am obsessed with this gorgeous jumpsuit from Avenlie. I featured it in red here and must admit, I love it even more in gold. There is a similar version sold at Nordstrom for double the price and they are almost identical. Trust me, this is a deal you do not want to miss! I hope you all have a fantastic new year! What are all of your New Year resolutions? Next Post It’s time for a Giveaway!! Happy new year to you! This jumpsuit is stunning. I love the gold, and the cause fit of it! I love how you switched up the look with pink accessories. I'm feeling inspired! Hope you have a happy new year! Love the sparkle! Happy New Year, Bethany! I've loved watching your blog grow and I can't wait to see what's in store for you in 2015! You look gorgeous! Love how this isn't overly sparkly!